In this article, we outline a practical approach to managing acne. We focus on the assessment of acne, use of topical treatments and the role of systemic therapy in treating acne. 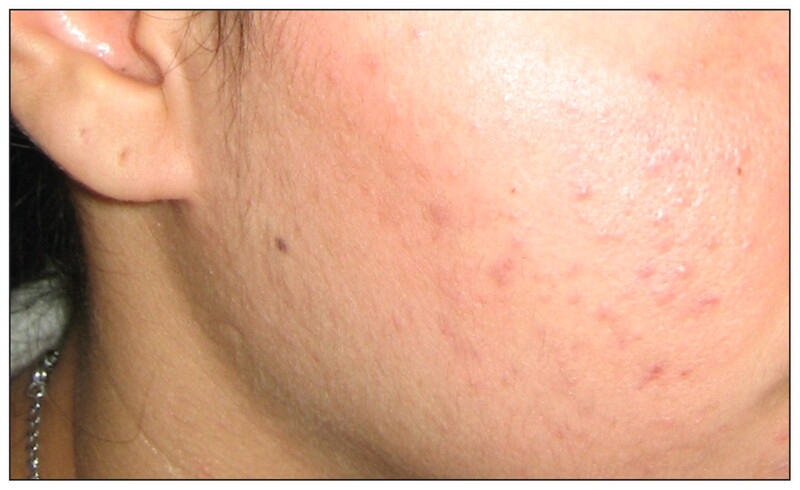 Grade I (mild) acne showing comedones with few inflammatory papules and pustules. 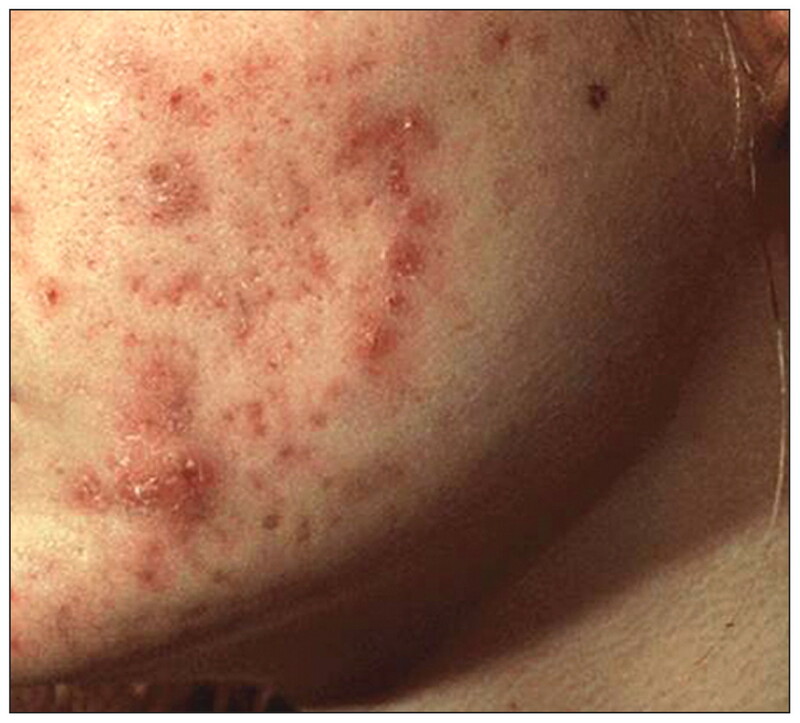 Grade II (moderate) acne showing papules and pustules. Grade III (moderately severe) acne showing numerous large painful nodules and pustules as well as some inflamed nodules. 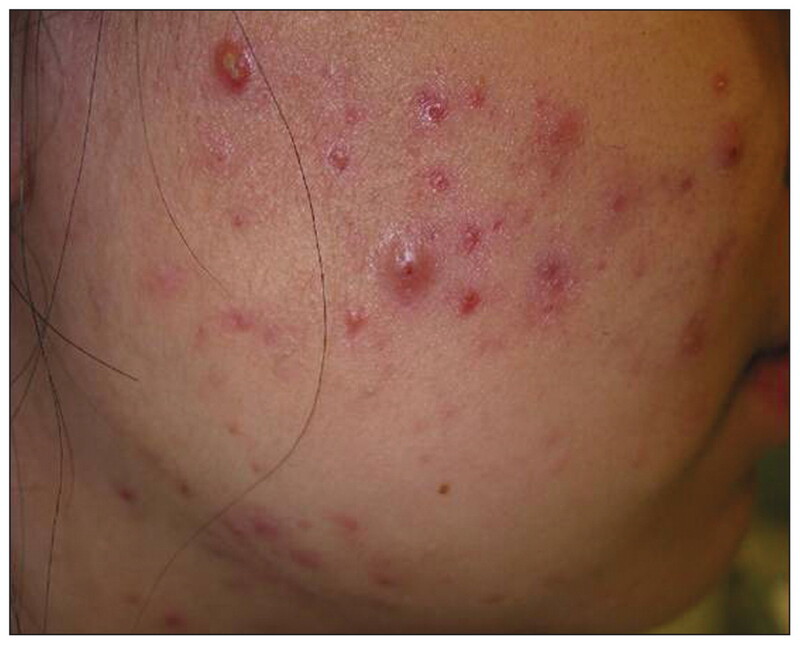 Grade IV (severe) acne showing many large inflamed nodules and pustules as well as scarring. Many research studies on acne therapies are small trials comparing the active drug with placebo or larger studies comparing different formulations of the same drug. How well do topical treatments work? The most commonly available topical retinoids are tretinoin, adapalene and tazarotene. A meta-analysis of five multicentre randomized investigator-blind trials involving 900 patients showed adapalene 0.1% gel to be as effective as, but less irritating than, tretinoin 0.025% gel.8 Different concentrations of retinoids affect tolerability. One commonly used approach is to start with the lowest concentration and increase as tolerated. Patients should ensure that their facial products, including sunscreens, are noncomedogenic. They should also avoid oil-based makeup. Some topical acne products contain a sunscreen. When should systemic therapy be started? Cutaneous side effects of isotretinoin include dry eyes, nose and lips, and dermatitis. Patients should use artificial tears, and generous amounts of moisturizer on the nose, lips and skin. What physical treatments are available? How should children and pregnant women be treated? What’s new in treating acne? Effective therapies for acne target one or more pathways in the pathogenesis of acne, and combination therapy gives better results than monotherapy. Topical therapies are the standard of care for mild to moderate acne. Systemic therapies are usually reserved for moderate or severe acne, with a response to oral antibiotics taking up to six weeks. Hormonal therapies provide effective second-line treatment in women with acne, regardless of the presence or absence of androgen excess. This review was solicited and has been peer reviewed.
. Psychological sequelae of acne vulgaris: results of a qualitative study. Can Fam Physician 2006;52:978–9.
. Guidelines of care for acne vulgaris management. J Am Acad Dermatol 2007;56:651–63.
. Acne. N Engl J Med 2005;352:1463–72.
. Management of acne: a report from a global alliance to improve outcomes in acne. J Am Acad Dermatol 2003;49(Suppl 1):S1–37.
. A double-blind evaluation of topical isotretinoin 0.05%, benzoyl peroxide gel 5% and placebo in patients with acne. Clin Exp Dermatol 1992;17:165–8.
. Comparing 2.5%, 5%, and 10% benzoyl peroxide on inflammatory acne vulgaris. Int J Dermatol 1986;25:664–7.
. The effect of antimicrobial agents on leukocyte chemotaxis. J Invest Dermatol 1978;70:51–5.
. The combined use of topical benzoyl peroxide and tretinoin in the treatment of acne vulgaris. Int J Dermatol 1979;18:489–96.
. Efficacy and tolerability of combined topical treatment of acne vulgaris with adapalene and clindamycin: a multicenter, randomized investigator blinded study. J Am Acad Dermatol 2003;49:S211–7.
. Therapeutic studies with a new combination benzoyl peroxide/clindamycin topical gel in acne vulgaris. Cutis 2001;67(Suppl 2):13–20.
. Effective over-the-counter acne treatments. Semin Cutan Med Surg 2008;27:170–6.
. Treatment of acne vulgaris without antibiotics: tertiary amine-benzoyl peroxide combination vs. benzoyl peroxide alone (Proactiv Solution). Int J Dermatol 2007;46:89–93.
. A systematic review of the evidence for ‘myths and misconceptions’ in acne management: diet, face-washing and sunlight. Fam Pract 2005;22:62–70.
. European surveillance study on the antibiotic susceptibility of Propionibacterium acnes. Clin Microbiol Infect 2005;11:204–13.
. Trimethoprim–sulfamethoxazole revisited. Arch Intern Med 2003;163:402–10.
. Comparison of five antimicrobial regimens for treatment of mild to moderate inflammatory facial acne vulgaris in the community: randomized controlled trial. Lancet 2004;364:2188–95.
. Erythromycin resistant propionibacteria in antibiotic treated acne patients: association with treatment failure. Br J Dermatol 1989;121:51–7.
. Sequential antibiotic therapy for acne promotes the carriage of resistant staphylococci on the skin of contacts. J Antimicrob Chemother 1996;38:829–37.
. Induction of proinflammatory cytokines by a soluble factor of propionibacterium acnes: implications for chronic inflammatory acne. Infect Immun 1995;63:3158–65.
. Tetracyclines inhibit connective tissue breakdown by multiple non-antimicrobial mechanisms. Adv Dent Res 1998;12:12–26.
. Antibiotic resistant acne: lessons from Europe. Br J Dermatol 2003;148:467–78.
. Is antibiotic resistance in cutaneous propionibacteria clinically relevant? Implications of resistance for acne patients and prescribers. Am J Clin Dermatol 2003;4:813–31.
. An accurate photographic method for grading acne: initial use in a double-blind clinical comparison of minocycline and tetracycline. J Am Acad Dermatol 1985;12:461–7.
. The role of androgens in determining acne severity in adult women. Br J Dermatol 2000;143:399–404.
. Acne resolution rates: results of a single-blind, randomized, controlled, parallel phase III trial with EE/CMA (Belara) and EE/LNG (Microgynon). Dermatology 2001;203:38–44.
. A randomized controlled trial of second-versus third-generation oral contraceptives in the treatment of acne vulgaris. Am J Obstet Gynecol 2003;188:1158–60. ACOG practice bulletin no. 110: noncontraceptive uses of hormonal contraceptives. Obstet Gynecol 2010;115:206–18.
. The effect of 2 combined oral contraceptives containing either drospirenone or cyproterone acetate on acne and seborrhea. Cutis 2002;69(suppl4):2–15.
. Oral spironolactone improves acne vulgaris and reduces sebum excretion. Br J Dermatol 1984;111:209–14.
. Anti-androgen treatment in women with acne: a controlled trial. Br J Dermatol 1986;114:705–16.
. Long-term safety of spironolactone in acne: results of an 8-year follow-up study. J Cutan Med Surg 2002;6:541–5.
. Comprehensive dermatologic drug therapy. 2nd ed. Philadelphia: WB Saunders; 2007.
. Isotretinoin use and subsequent depression and suicide. Am J Clin Dermatol 2003;4:493–505. Product monograph. Accutane Roche. Mississauga (ON): Hoffmann-La Roche. 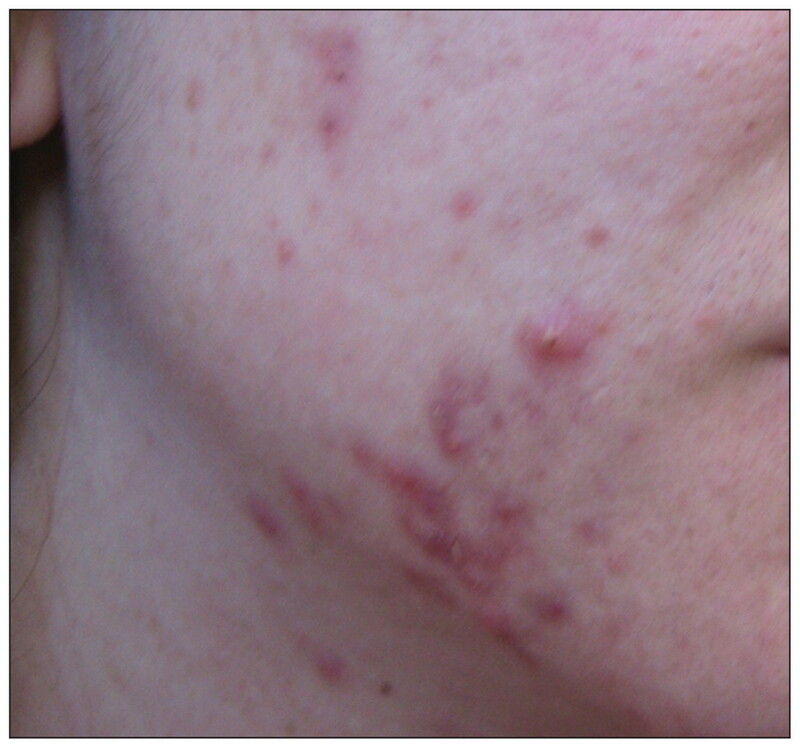 2010.
. Isotretinoin for acne vulgaris — 10 years later: a safe and successful treatment. Br J Dermatol 1993;129:292–6.
. A comparative study of tea-tree oil versus benzoyl peroxide in the treatment of acne. Med J Aust 1990;153:455–8.
. Laser resurfacing for facial acne scars. Cochrane Database of Systematic Reviews 2001, Issue 1. Art. No. CD001866. doi:10.1002/14651858.CD001866.
. The safety and efficacy of salicylic acid chemical peels in darker racial-ethnic groups. Dermatol Surg 1999;25:18–22.
. Intralesional corticosteroids in the treatment of nod-ulocystic acne. Arch Dermatol 1983;119:480–1. .United States/Canada Dapsone Gel Study Group.Efficacy and safety of dapsone gel 5% for the treatment of acne vulgaris in adolescents. Cutis 2008;81:171–8.
. Hematologic safety of dapsone gel, 5%, for topical treatment of acne vulgaris. Arch Dermatol 2008;144:1564–70.